Enslaved peoples were brought to the Americas from many places in Africa, but a large majority came from relatively few ethnic groups. Drawing on a wide range of materials in four languages as well as on her lifetime study of slave groups in the New World, Gwendolyn Midlo Hall explores the persistence of African ethnic identities among the enslaved over four hundred years of the Atlantic slave trade. Hall traces the linguistic, economic, and cultural ties shared by large numbers of enslaved Africans, showing that despite the fragmentation of the diaspora many ethnic groups retained enough cohesion to communicate and to transmit elements of their shared culture. 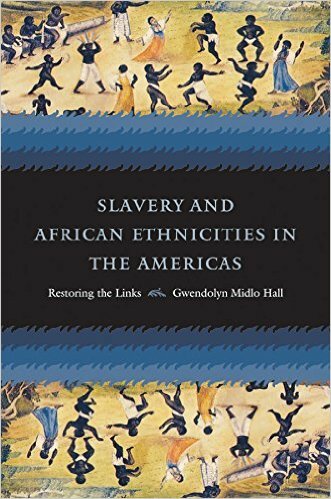 Hall concludes that recognition of the survival and persistence of African ethnic identities can fundamentally reshape how people think about the emergence of identities among enslaved Africans and their descendants in the Americas, about the ways shared identity gave rise to resistance movements, and about the elements of common African ethnic traditions that influenced regional creole cultures throughout the Americas.Enslaved peoples were brought to the Americas from many places in Africa, but a large majority came from relatively few ethnic groups. Gwendolyn Midlo Hall traces the linguistic, economic, and cultural ties shared by large numbers of enslaved Africans, showing that despite the fragmentation of the diaspora many ethnic groups retained enough cohesion to communicate and to transmit elements of their shared culture. Hall concludes that recognizing the persistence of African ethnic identities can reshape how people think about the emergence of identities among enslaved Africans and their descendants in the Americas, about the ways shared identity gave rise to resistance movements, and about the elements of common African ethnic traditions that influenced regional creole cultures throughout the Americas.